Last week the annual Remote Sensing and Photogrammetry Society (RSPSoc) conference was held in Aberystwyth. Now I’ve stepped down as RSPSoc Chairman I could relax and enjoy this year’s event as a delegate. Arriving on Wednesday morning, the first session I attended was organised by the Technology and Operational Procedures Special Interest Group (TOPSIG), which was focused on Operational Earth observation. There were a great range of presentations, and I particularly enjoyed the user insights by Andy Wells on how customers are really using imagery. Recent developments in on-the-fly importing, georeferencing and autocorrelation means bringing data together from different sources isn’t a time consuming chore. Users can therefore spend more time analysing data, extracting information and adding value to their organisations or research. In addition, as highlighted by other presentations, open software repositories continue to grow and now include complex algorithms that were once only available to specialists. Finally, Steve Keyworth reminded us that what we do should be seen as a component of the solution rather than the specification; the ultimate aim should be on solving the customer’s problem, which in the current climate is often financially motivated. On Thursday I co-chaired the Water and Marine Environments session alongside Professor Heiko Balzter, on behalf of the Marine Optics Special Interest Group (SIG). My presentation was focused on the European Space Agency (ESA) Landsat archive that’s been acquired via the ESA ground stations. This data is being reprocessed to create a consistent high resolution visible and infrared image dataset combining the three primary sensors used by the series of Landsat satellites; MSS (Multi-spectral Scanner), TM (Thematic Mapper), and ETM+ (Enhanced Thematic Mapper Plus). Although historical Landsat missions are not ideally suited to observing the ocean, due to a low signal-to-noise ratio, features can be clearly seen and the new processing setup means images are being processed over the open ocean. Mark Danson’s keynote lecture on Friday morning described the application of terrestrial laser scanners to understanding forest structure. He showcased his post PhD research which has led to the development of the Salford Advanced Laser Canopy Analyser, a dual-wavelength full-waveform laser scanner. The presentation also showed the importance of fieldwork in understanding what remote techniques are actually sensing, and in this case included a team of people cutting down example trees and counting every leaf! Mark also made me feel less guilty that I am still working on a component of my PhD – atmospheric correction. In research your own learning curve, and the scientific process, mean you gain new insights as you understand more, often explaining why answers are not as simple as you might have assumed. It’s one of the reasons why I love doing research. Overall, I had a great time at RSPSoc, catching up and seeing what’s new in the field. My next conference event is Ocean Optics, in the US, at the end of October where I’ll be discussing citizen science in a marine science context. 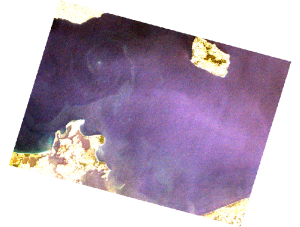 This entry was posted in Atmospheric Correction, Data, Earth Observation, ESA, Landsat, Oceans, Remote Sensing, Research, Space Industry, Understanding Space, visualisation and tagged Atmospheric Correction, Earth Observation, ESA, Landsat, ocean, Ocean Optics, photogrammetry, pixalytics, remote sensing, Remote Sensing and Photogrammetry Society, Research, RSPSoc by Andy. Bookmark the permalink.